Your Search Results for "Mouldings"
We found 42 items that matched your search. 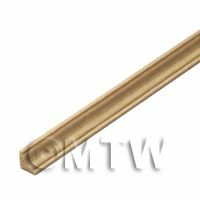 Product ID: 9585 Commonly used as decorative moulding or as architrave. This item can be cut, sanded, painted and stained. All of our extensive range of 1:12th scale dolls house miniature mouldings are made from high quality wood in the United Kingdom. 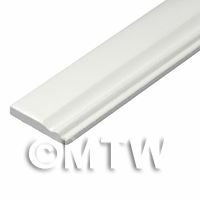 These quality mouldings are ready to paint or stain and can be glued or tacked into place.Each strip is 18 inches long and can easily be cut to shorter lengths. Product ID: 9586 This item can be cut, sanded, painted and stained. All of our extensive range of 1:12th scale dolls house miniature mouldings are made from high quality wood in the United Kingdom. 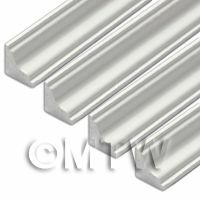 These quality mouldings are ready to paint or stain and can be glued or tacked into place.Each strip is 18 inches long and can easily be cut to shorter lengths. Product ID: 9587 This item can be cut, sanded, painted and stained. All of our extensive range of 1:12th scale dolls house miniature mouldings are made from high quality wood in the United Kingdom. 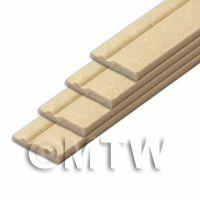 These quality mouldings are ready to paint or stain and can be glued or tacked into place.Each strip is 18 inches long and can easily be cut to shorter lengths. Product ID: 9588 This item can be cut, sanded, painted and stained. All of our extensive range of 1:12th scale dolls house miniature mouldings are made from high quality wood in the United Kingdom. 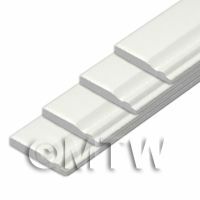 These quality mouldings are ready to paint or stain and can be glued or tacked into place.Each strip is 18 inches long and can easily be cut to shorter lengths. Product ID: 9589 This item can be cut, sanded, painted and stained. All of our extensive range of 1:12th scale dolls house miniature mouldings are made from high quality wood in the United Kingdom. 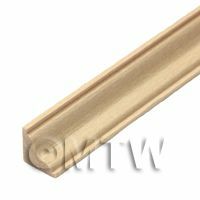 These quality mouldings are ready to paint or stain and can be glued or tacked into place.Each strip is 18 inches long and can easily be cut to shorter lengths. Product ID: 9590 This item can be cut, sanded, painted and stained. All of our extensive range of 1:12th scale dolls house miniature mouldings are made from high quality wood in the United Kingdom. 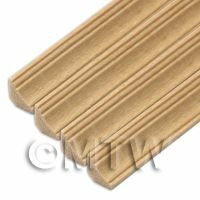 These quality mouldings are ready to paint or stain and can be glued or tacked into place.Each strip is 18 inches long and can easily be cut to shorter lengths. Product ID: 9591 This item can be cut, sanded, painted and stained. 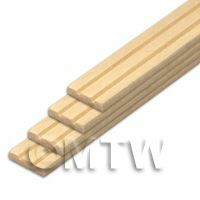 All of our extensive range of 1:12th scale dolls house miniature mouldings are made from high quality wood in the United Kingdom. 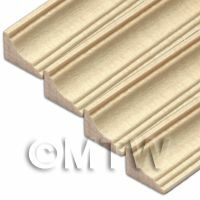 These quality mouldings are ready to paint or stain and can be glued or tacked into place.Each strip is 18 inches long and can easily be cut to shorter lengths. Product ID: 9592 This item can be cut, sanded, painted and stained. All of our extensive range of 1:12th scale dolls house miniature mouldings are made from high quality wood in the United Kingdom. 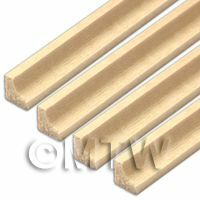 These quality mouldings are ready to paint or stain and can be glued or tacked into place.Each strip is 18 inches long and can easily be cut to shorter lengths. Product ID: 9593 This item can be cut, sanded, painted and stained. All of our extensive range of 1:12th scale dolls house miniature mouldings are made from high quality wood in the United Kingdom. 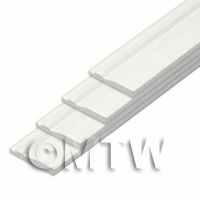 These quality mouldings are ready to paint or stain and can be glued or tacked into place.Each strip is 18 inches long and can easily be cut to shorter lengths. Product ID: 9594 This item can be cut, sanded, painted and stained. All of our extensive range of 1:12th scale dolls house miniature mouldings are made from high quality wood in the United Kingdom. 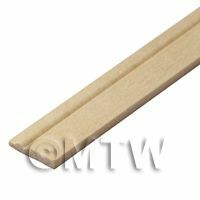 These quality mouldings are ready to paint or stain and can be glued or tacked into place.Each strip is 18 inches long and can easily be cut to shorter lengths. Product ID: 9595 This item can be cut, sanded, painted and stained. All of our extensive range of 1:12th scale dolls house miniature mouldings are made from high quality wood in the United Kingdom. 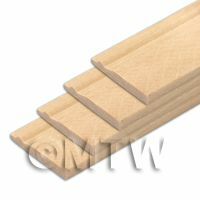 These quality mouldings are ready to paint or stain and can be glued or tacked into place.Each strip is 18 inches long and can easily be cut to shorter lengths. Product ID: 9596 This item can be cut, sanded, painted and stained. All of our extensive range of 1:12th scale dolls house miniature mouldings are made from high quality wood in the United Kingdom. 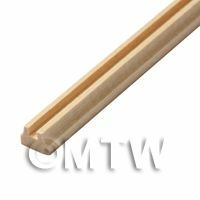 These quality mouldings are ready to paint or stain and can be glued or tacked into place.Each strip is 18 inches long and can easily be cut to shorter lengths. Product ID: 9597 This item can be cut, sanded, painted and stained. All of our extensive range of 1:12th scale dolls house miniature mouldings are made from high quality wood in the United Kingdom. 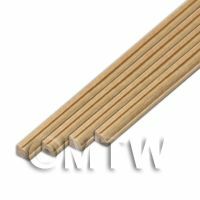 These quality mouldings are ready to paint or stain and can be glued or tacked into place.Each strip is 18 inches long and can easily be cut to shorter lengths. Product ID: 9598 This item can be cut, sanded, painted and stained. All of our extensive range of 1:12th scale dolls house miniature mouldings are made from high quality wood in the United Kingdom. 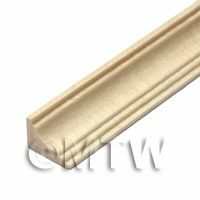 These quality mouldings are ready to paint or stain and can be glued or tacked into place.Each strip is 18 inches long and can easily be cut to shorter lengths. Product ID: 9599 This item can be cut, sanded, painted and stained. All of our extensive range of 1:12th scale dolls house miniature mouldings are made from high quality wood in the United Kingdom. 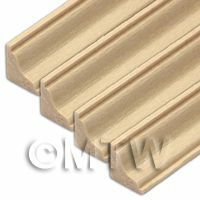 These quality mouldings are ready to paint or stain and can be glued or tacked into place.Each strip is 18 inches long and can easily be cut to shorter lengths. Product ID: 9600 This item can be cut, sanded, painted and stained. All of our extensive range of 1:12th scale dolls house miniature mouldings are made from high quality wood in the United Kingdom. 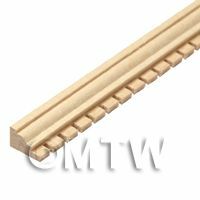 These quality mouldings are ready to paint or stain and can be glued or tacked into place.Each strip is 18 inches long and can easily be cut to shorter lengths. Product ID: 9601 All of our extensive range of 1:12th scale dolls house miniature mouldings are made from high quality wood in the United Kingdom. 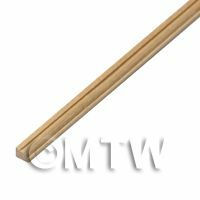 These quality mouldings are ready to paint or stain and can be glued or tacked into place.Each strip is 18 inches long and can easily be cut to shorter lengths. Product ID: 9602 This item can be cut, sanded, painted and stained. All of our extensive range of 1:12th scale dolls house miniature mouldings are made from high quality wood in the United Kingdom. 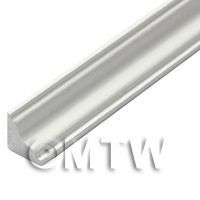 These quality mouldings are ready to paint or stain and can be glued or tacked into place.Each strip is 18 inches long and can easily be cut to shorter lengths. 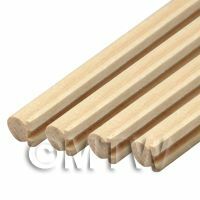 Product ID: 9603 All of our extensive range of 1:12th scale dolls house miniature mouldings are made from high quality wood in the United Kingdom. 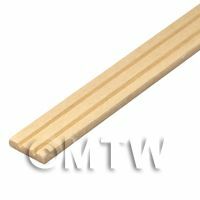 These quality mouldings are ready to paint or stain and can be glued or tacked into place.Each strip is 18 inches long and can easily be cut to shorter lengths. Product ID: 9604 This item can be cut, sanded, painted and stained. All of our extensive range of 1:12th scale dolls house miniature mouldings are made from high quality wood in the United Kingdom. 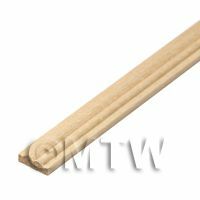 These quality mouldings are ready to paint or stain and can be glued or tacked into place.Each strip is 18 inches long and can easily be cut to shorter lengths. 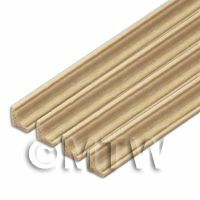 Product ID: 16192 Commonly used as decorative moulding or as architrave. This item can be cut, sanded, painted and stained. All of our extensive range of 1:12th scale dolls house miniature mouldings are made from high quality wood in the United Kingdom. 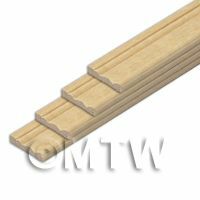 These quality mouldings are ready to paint or stain and can be glued or tacked into place.Each strip is 18 inches long and can easily be cut to shorter lengths. Product ID: 16193 This item can be cut, sanded, painted and stained. All of our extensive range of 1:12th scale dolls house miniature mouldings are made from high quality wood in the United Kingdom. 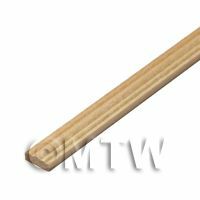 These quality mouldings are ready to paint or stain and can be glued or tacked into place.Each strip is 18 inches long and can easily be cut to shorter lengths. Product ID: 16194 This item can be cut, sanded, painted and stained. All of our extensive range of 1:12th scale dolls house miniature mouldings are made from high quality wood in the United Kingdom. 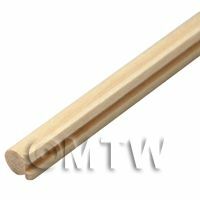 These quality mouldings are ready to paint or stain and can be glued or tacked into place.Each strip is 18 inches long and can easily be cut to shorter lengths. Product ID: 16195 This item can be cut, sanded, painted and stained. All of our extensive range of 1:12th scale dolls house miniature mouldings are made from high quality wood in the United Kingdom. These quality mouldings are ready to paint or stain and can be glued or tacked into place.Each strip is 18 inches long and can easily be cut to shorter lengths. Product ID: 16196 This item can be cut, sanded, painted and stained. All of our extensive range of 1:12th scale dolls house miniature mouldings are made from high quality wood in the United Kingdom. These quality mouldings are ready to paint or stain and can be glued or tacked into place.Each strip is 18 inches long and can easily be cut to shorter lengths. Product ID: 16197 This item can be cut, sanded, painted and stained. All of our extensive range of 1:12th scale dolls house miniature mouldings are made from high quality wood in the United Kingdom. 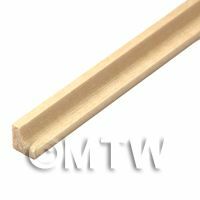 These quality mouldings are ready to paint or stain and can be glued or tacked into place.Each strip is 18 inches long and can easily be cut to shorter lengths. Product ID: 16198 This item can be cut, sanded, painted and stained. All of our extensive range of 1:12th scale dolls house miniature mouldings are made from high quality wood in the United Kingdom. 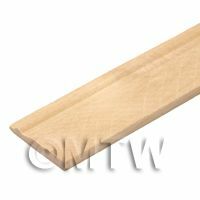 These quality mouldings are ready to paint or stain and can be glued or tacked into place.Each strip is 18 inches long and can easily be cut to shorter lengths. Product ID: 16199 This item can be cut, sanded, painted and stained. All of our extensive range of 1:12th scale dolls house miniature mouldings are made from high quality wood in the United Kingdom. 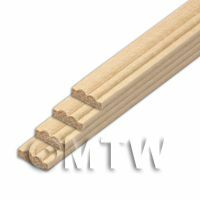 These quality mouldings are ready to paint or stain and can be glued or tacked into place.Each strip is 18 inches long and can easily be cut to shorter lengths. Product ID: 16200 This item can be cut, sanded, painted and stained. All of our extensive range of 1:12th scale dolls house miniature mouldings are made from high quality wood in the United Kingdom. 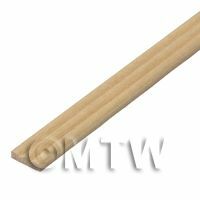 These quality mouldings are ready to paint or stain and can be glued or tacked into place.Each strip is 18 inches long and can easily be cut to shorter lengths. Product ID: 16201 This item can be cut, sanded, painted and stained. All of our extensive range of 1:12th scale dolls house miniature mouldings are made from high quality wood in the United Kingdom. 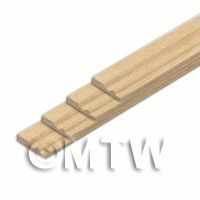 These quality mouldings are ready to paint or stain and can be glued or tacked into place.Each strip is 18 inches long and can easily be cut to shorter lengths. Product ID: 16202 This item can be cut, sanded, painted and stained. All of our extensive range of 1:12th scale dolls house miniature mouldings are made from high quality wood in the United Kingdom. 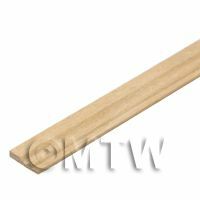 These quality mouldings are ready to paint or stain and can be glued or tacked into place.Each strip is 18 inches long and can easily be cut to shorter lengths. Product ID: 16203 This item can be cut, sanded, painted and stained. All of our extensive range of 1:12th scale dolls house miniature mouldings are made from high quality wood in the United Kingdom. 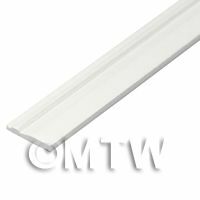 These quality mouldings are ready to paint or stain and can be glued or tacked into place.Each strip is 18 inches long and can easily be cut to shorter lengths. Product ID: 16204 This item can be cut, sanded, painted and stained. All of our extensive range of 1:12th scale dolls house miniature mouldings are made from high quality wood in the United Kingdom. 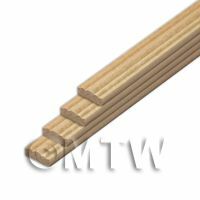 These quality mouldings are ready to paint or stain and can be glued or tacked into place.Each strip is 18 inches long and can easily be cut to shorter lengths. Product ID: 16205 This item can be cut, sanded, painted and stained. All of our extensive range of 1:12th scale dolls house miniature mouldings are made from high quality wood in the United Kingdom. 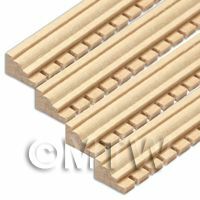 These quality mouldings are ready to paint or stain and can be glued or tacked into place.Each strip is 18 inches long and can easily be cut to shorter lengths. Product ID: 16206 This item can be cut, sanded, painted and stained. All of our extensive range of 1:12th scale dolls house miniature mouldings are made from high quality wood in the United Kingdom. 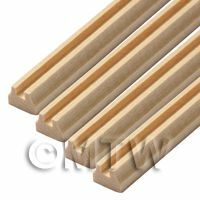 These quality mouldings are ready to paint or stain and can be glued or tacked into place.Each strip is 18 inches long and can easily be cut to shorter lengths. Product ID: 16207 This item can be cut, sanded, painted and stained. All of our extensive range of 1:12th scale dolls house miniature mouldings are made from high quality wood in the United Kingdom. These quality mouldings are ready to paint or stain and can be glued or tacked into place.Each strip is 18 inches long and can easily be cut to shorter lengths. 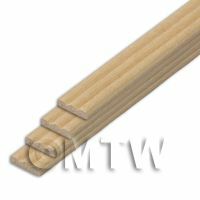 Product ID: 16208 All of our extensive range of 1:12th scale dolls house miniature mouldings are made from high quality wood in the United Kingdom. These quality mouldings are ready to paint or stain and can be glued or tacked into place.Each strip is 18 inches long and can easily be cut to shorter lengths. Product ID: 16209 This item can be cut, sanded, painted and stained. All of our extensive range of 1:12th scale dolls house miniature mouldings are made from high quality wood in the United Kingdom. These quality mouldings are ready to paint or stain and can be glued or tacked into place.Each strip is 18 inches long and can easily be cut to shorter lengths. 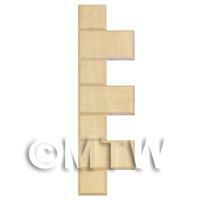 Product ID: 16210 All of our extensive range of 1:12th scale dolls house miniature mouldings are made from high quality wood in the United Kingdom. These quality mouldings are ready to paint or stain and can be glued or tacked into place.Each strip is 18 inches long and can easily be cut to shorter lengths. 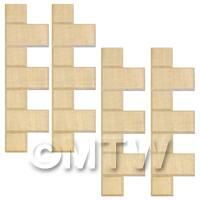 Product ID: 16211 This item can be cut, sanded, painted and stained. All of our extensive range of 1:12th scale dolls house miniature mouldings are made from high quality wood in the United Kingdom. 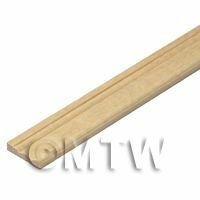 These quality mouldings are ready to paint or stain and can be glued or tacked into place.Each strip is 18 inches long and can easily be cut to shorter lengths. Product ID: 17151 This accessory is part of our affordable range of dolls house miniature components. These Items have been prepared for you to either stain or paint depending on the scheme of your dolls house both inside and out. Product ID: 17258 This accessory is part of our affordable range of dolls house miniature components. These Items have been prepared for you to either stain or paint depending on the scheme of your dolls house both inside and out.